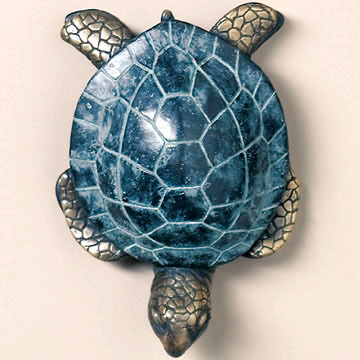 This exclusive Sea Turtle Door Knocker is cast using the "lost wax" process. Cast from a wax model, this is the most precise metal casting technique in existence, ensuring accurate reproductions of the original sculpture and exquisite detail. "Lost wax" casting dates back thousands of years. While modern methods and materials have improved the technique, it is still an extremely labor intensive and expensive process. An elegant and timeless piece of artwork that will be enjoyed for a lifetime. Makes a great gift! 6 inches H. x 4 inches W.